Description: Lincoln enjoyed comparing heights with tall men. Repeatedly he would stand back-to-back and enjoy a measuring-up with friends and acquaintances. This scene, with Mr. Lincoln and the one-armed soldier actually occurred in a church hospital ward near Washington, on one of Lincoln's visits to wounded soldiers. Poet Walt Whitman observed and recorded this incident in 1863. 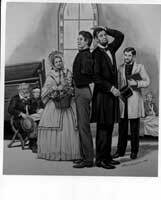 Mrs. Lincoln is in the picture, along with a doctor, two soldier patients and a visitor. *The back of the positive contains the hand written description of the subject by the artist.